This view of the importance of An Historical Essay Concerning Witchcraft is echoed in more recent works. For example, The Devil in Disguise (2011) concurs with the assessment of the Essay and also suggests that an earlier pamphlet The Case of the Hertfordshire Witchcraft Consider’d is likely to have been written by Hutchinson. An account of that Hertfordshire witch trial against Jane Wenham, together with Hutchinson and Hans Sloane’s involvement is to be found on the Sloane Letters blog. 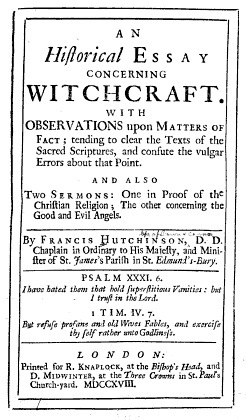 Hutchison was concerned by the level of superstition which characterised the witch hunts, and moved from sharing that concern with Sloane to publishing his Essay in 1718, with the aim of preventing that superstition from spreading. Sloane is not the only Irish link to this story. A second edition of the Historical Essay was published in 1720, the year Hutchinson was appointed Bishop of Down and Conor. While not active in his religious duties as bishop, he took an interest in conditions in his diocese. He was particularly concerned with the problems of Irish speakers in the Church of Ireland, especially the community on Rathlin Island. He had a bilingual catechism and primer printed for their use, and later an Irish catechism. In all these the Irish was rendered phonetically in a Roman script. More on his adaptation of Irish and his attempts to proselytize among the Catholic population is available on History Ireland. He also took an interest in Irish history and culture, making contact with scholars such as Cornelius Nary and Anthony Raymond, and publishing his learned Defence of the Antient Historians in 1734. It takes the form of a “dialogue between a Protestant and a Papist, and Englishman and an Irishman” and includes references to the work of Hugh MacCurtain, Laurence Walsh and Geoffrey Keating. (It was printed by S. Powell for J. Smith & W. Bruce.) He also published pamphlets on better use of resources (bog reclamation, navigation on the River Bann, improving fisheries), how to reduce poverty and unemployment and the need for a national bank in Ireland. Despite his antipathy to the doctrines of Catholicism he got on well with his Catholic neighbours, and was also respected by the Presbyterian community. The last witchtrial in Ireland was probably the Island Magee case on 31st March 1711. The Witchcraft Act of 1735 repealed the Witchcraft Laws, instead making it illegal to claim magical powers or that anyone was practicing witchcraft. Hutchinson died on 23 June 1739 and is buried at Portglenone, Co. Antrim. Toby Barnard (2004/2008) ‘Hutchinson, Francis (1660–1739)’, Oxford Dictionary of National Biography, Oxford University Press.